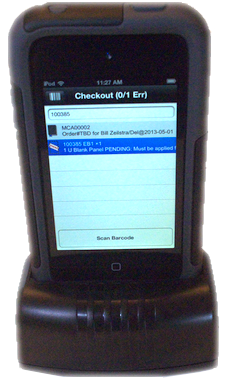 Rugged industrial high-speed barcode scanning is easy with RentalPointToGo and the LineaPro handheld mobile barcode scanning accessory from Infinite Peripherals, which includes a rugged housing that makes your iOS device suitable for use in warehouses, industrial locations, and even out in the field. Contact RentalPoint to find out which hardware options you should order, and how to order compatible barcode scanning hardware. There are various barcode scanning engine options, and other optional hardware accessories, so be sure to enquire.